Columbus noticed something very odd on his third voyage to the New World (1498-1500): his compass didn't always seem to work very well. When he passed 'the line from north to south a hundred leagues west of the Azores' in a westerly direction, 'the needle shifted by a quarter north-westwards, and continued to shift farther to the north-west as we sailed on.' What Columbus discovered was what used to be called the 'Line of No Variation', and is now referred to as the 'Agonic Line', i.e. 'the line having no angle'. 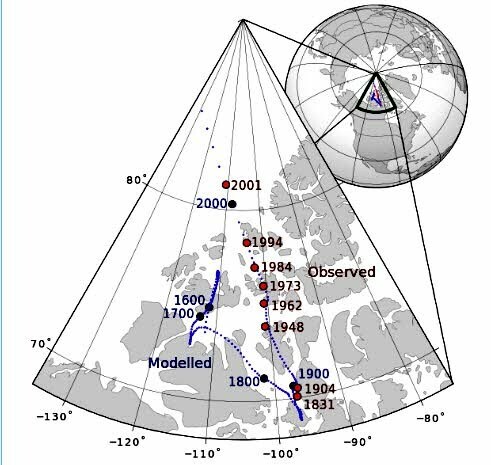 In Europe, the same phenomenon exists, of course, but the difference between True North and Magnetic North is not as severe, although it increases dramatically towards the poles. If you don't have a GPS you will need to take all of this into account when you go hiking, especially in the USA. If you are in Washington State, the magnetic N on your compass will point up to 20 degrees east of True North ... and if you are in Maine, the magnetic N on your compass will point up to 20 degrees west of True North. If you don't know this, you could get very badly lost. In Israel, the difference is only a little over 4 degrees, so it's not such a big deal. You just need to remember that True North is a little over 4 degrees less than what you are seeing as the direction of the magnetic red N, so just turn your compass a little over 4 degrees in a counter-clockwise direction so that the red N appears 4 degrees to the right of the arrowhead. If you want to know how to calibrate your compass, wherever you are, click here. It could save your life ... unless you have a GPS ... or prefer to stay at home studying interesting subjects such as the Agonic Line.